You’re looking for a new necklace, something that really speaks to you. But where to start? There are SO many different types of chain links, chain styles, types of necklaces, and necklace materials. How do you know which combination of features is the one that is PERFECT for you? Perhaps you are looking to get a gift for a friend, sister, mother, or grandmother and not sure where to start. You know you want to get a necklace but there are so many different parts of a necklace that comprise its beauty -- where to begin? We’ve done some investigating and have compiled a complete guide to different types of necklaces. Are you uncertain about which types of chains are the right ones for different necklaces? Perhaps you don’t know which chain clasps are best? Necklace chain length and necklace materials are also something you should consider when searching for that perfect piece of jewelry. Whether you’re looking for popular necklaces or just trying to determine which type of necklace will be your next buy, this guide to different types of necklaces will answer all your questions. Jewelry chain types can create a distinctive style for each necklace. In general, a chain is a strand of interlocking rings, discs, or beads, and it is usually composed of metal. While chain links can be made by hand, most jewelry manufacturers use modern designs that are made by machinery. There are a lot of different link styles and combinations to create different fashionable looks. Cable Chain. The cable chain is one of the most classic and popular types of chains. This type of chain was created from interlocking oval links of the same size. These cable links are fairly easy to make and work well with delicate pendants. Did you know: the word “cable” stems from the Latin words capulum (lasso, rope) and capere (to take). Marine Chain. The marine chain is named for its similarity to nautical chains. It is comprised of oval links, each of which has a horizontal bar across the center. Marine links resemble cable chains in that they can interlock, and curb links in that they rest flat. Figaro Chain. The figaro chain is a modified version of the curb chain. The interlocking flat links vary in size and a pattern is usually formed with trios of smaller links alternating with a longer link. The name “figaro” is Italian -- chain makers were inspired by famous operas and plays, one of which featured a barber named Figaro. Rope Chain. The rope chain is the most popular textural chain style. The chain links of a rope chain are twisted and looped together in a pattern resembling a rope. Wheat Chain. The wheat chain is named for its appearance similar to that of the tips of wheat stalks. Oval and twisted oval links are twisted together in the same direction to form the wheat chain. Bead Chain. The bead chain is made from ball-shaped links connected with small breaks between them. Bead chains are generally used for dog tags, keychains and ornamental jewelry. Box Chain. A box chain is composed of square links arranged side-by-side to create a smooth, 4-sided shape. Herringbone Chain. The herringbone chain is formed from pressing v-shaped links, which are arranged in alternating directions. The end result is a flat and fluid design. The “herringbone” pattern is also very common in textiles and home decor, and was named after the unique skeletal structure of a herring fish. Snake Chain. A snake chain is made from tightly linked wavy plates. The end result is a smooth, round look with a zigzag pattern, resembling that of a snake. Jewelry clasps can be really helpful, or really annoying, just depending. The clasp might not be the most beautiful or elegant feature of the piece of jewelry, but it is probably the most important! Though you want your necklace to have style, elegance, and pop, you also want it to stay on. Without a clasp (or with a faulty clasp!) your fashionable new necklace will be useless. Finding the right type of chain clasp is important to make sure your jewelry is wearable, so you can continue to wear it everyday! Barrel clasps are made of two metal pieces that screw together. Each piece is attached to one end of the piece of jewelry and, when screwed together, resemble a barrel. These clasps are very versatile, come in many different finishes and sizes, and can even be decorative. Often, they are simple, either solid gold or silver, and designed to blend in with the rest of the jewelry. The main drawback to this kind of clasp is that it requires two hands to fasten, so it’s not ideal unless you have another person to help you put it on. The lobster clasp is named for its resemblance to a lobster claw. It is a spring-loaded and self-closing style of clasp. To open the lobster clasp, simply push down on the lever with your thumb and the bottom of the “claw” will swing inward. To close, release the lever. Lobster clasps are available in a variety of sizes, including a swivel style in which the clasp can rotate 360 degrees independently of the jewelry. The swivel style lobster clasp is ideal for jewelry that tends to move around a lot, like bracelets and anklets. The spring ring clasp is one of the most common types of clasps you will see on all kinds of jewelry pieces. As the name suggests, the metal ring has a spring mechanism. To open the spring ring clasp, pull back on the small lever and the spring will compress. This will leave an opening for you to slide the jump ring inside. Releasing the lever causes the clasp to lock automatically. The spring ring clasp is very versatile and secure. However, it can be difficult to fasten this type of clasp with one hand and particularly if the clasp is super small. The toggle clasp is a very unique style of clasp. It is made of 2 distinctly different pieces: an open circle is at one end, while the other end has a long bar, or “T.” To close the toggle clasp, the bar is slipped through the open circle. Toggle clasps come in many different sizes and embellishments, and can be used on any type of jewelry. Usually, toggle clasps are designed to add an aesthetic design and a decorative accent. Toggle clasps are best used on heavier pieces of jewelry to ensure that there is enough pressure so that the bar doesn’t slip out during wear. A magnetic clasp is composed of two magnetic pieces that attract one another and snap together. Magnetic clasps come in a variety of shapes, sizes and styles -- magnetic clasps can be square, rectangular round, small, large, delicate, or texturized with rhinestones. These clasps are easy to fasten, work well with all types of jewelry, and are particularly good for older women with limited dexterity. The fishhook clasp is a less popular type of clasp. One end is a metal hook, and the other is a oval box. The hook is fastened inside the oval box, and can sometimes even lock due to a spring mechanism. Fishhook clasps can be really ornate and decorated with diamonds. This type of clasp can be tricky one-handed, and is more popular for a necklace than a bracelet. So, you know now which types of chains you like best and which chain clasps are best for you, but, what length? Maybe you’re looking for something specific, like a 16 inch necklace, an 18 inch necklace, a 20 inch necklace, or a 24 inch chain? It can be difficult to determine which length necklace you should get, and not everyone knows the different lengths of necklaces. Usually, particular types of necklaces already come in particular lengths. Knowing which length you want and then matching it with the right design can make the shopping process infinitely easier. You can always choose which length you think is best for you, but there are also typical necklace chain lengths. You’re almost ready to go out and buy that perfect necklace, but what material? Necklace materials determine, in part, the quality of the necklace. Necklace materials also express the overall style you are going for. Whether you’re a punk rocker or a mother of three (or both! ), there are a lot of different kinds of popular necklaces with various materials for you to choose from. Beads. Beads have been used to make jewelry for over 3,500 years. Today, beads are usually made of plastic or some type of acrylic. They can also be made of other materials such as metal, wood, gems, or crystals. They come in various sizes, with the smallest ones called seed beads. Crochet or Knitting Yarn. When thinking of common necklace materials, not a lot of people would consider yarn a common material. However, yarn makes for good necklace materials for two reasons: it is inexpensive to buy and very strong! Crochet yarn comes in so many different colors, textures, and designs that you can make a super fancy necklace in no time! For cool ideas of crochet yarn necklaces, check out this site. No matter what style you are going for, it is super easy to find something extravagant or simple with a crochet yarn necklace. Gold or Silver. Gold and silver are the most common form of material for necklaces. However, the higher the quality, the more expensive. Gold and silver necklaces come in a variety of sizes and designs. For high quality, custom made gold and silver jewelry, check out Sincerely Silver and Gracefully Made Jewelry. Leather. Leather is one of the strongest necklace materials and comes in so many different widths, textures, and colors. Leather necklaces can be fancy or casual, just depending on what you attach to them. With a leather necklace, you can be sure it will last you a long time! If you want to dress up your leather necklace, consider ones with pendants, charms, or beads. Pearls. What comes to mind when you think of a pearl necklace? Elegance. Grace. Sophistication. Both real and faux pearls come in a wide variety of sizes and colors, and can have single or multiple strands. Did you know: most people can’t tell whether the pearls are real or faux just by looking at them! Today, pearls are commonly paired with business suits, cocktail dresses, or even cotton blouses. Regardless of the event, a pearl necklace will definitely step up your game and you will absolutely get some compliments! There are a LOT of different types of necklaces. Now that you know which types of chains, chain clasps, necklace chain length, and necklace materials you want, consider these 23 different types of necklaces! A bib necklace, as the name suggests, covers you up like a bib. It can come in a variety of different layered chains or a single large element to cover up the breastbone. Variations of this type of necklace can be more dainty, as long as it maintains layers of bib. This popular necklace have been considered high-end jewelry for a number of years but can often be very expensive. Chains can come in gold, silver, titanium, copper, or any other material. The use of the necklace chain as a purely decorative element can be taken for granted. What is a choker? Well, it is generally between 14 and 16 inches in length and is worn close to the neck. Choker necklaces are made from a variety of materials. 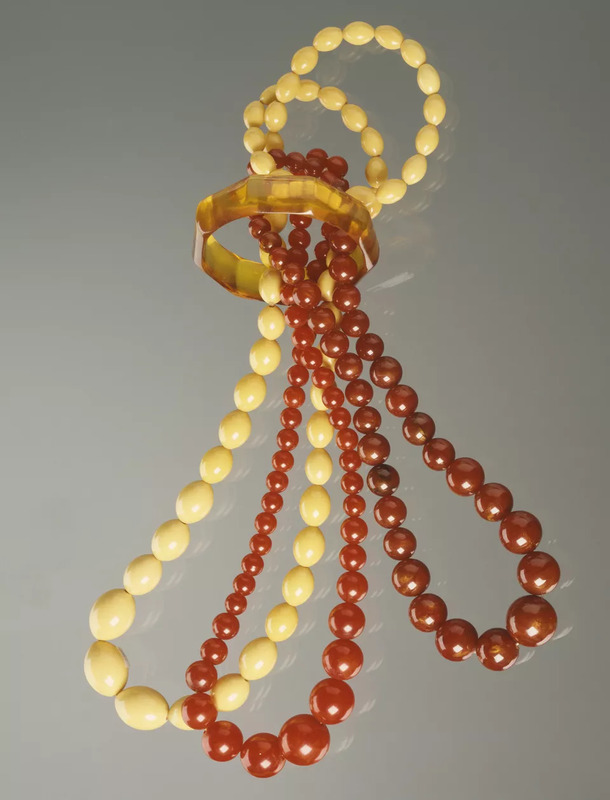 In the Victorian Era, common materials for this necklace were velvet, gold, and ribbon. Choker necklaces can incorporate other necklace styles by adding a pendant, graduating beads, or festoon-like drops. One of the biggest advantages of wearing a choker necklace is that they almost always go with everything you wear, regardless of style or design. Wearing a necklace so close to the neckline is incredibly flattering to the neck. Chokers can be made of a lot of different kinds of materials today, such as leather, gold, velvet, or thick string. Pair a thin choker with a longer opera length necklace for high contrast. Chokers look good with v-necks and scoop necks. When you’re wearing off-the-shoulder outfits, turtlenecks, V-necks, or boat necks, the collar necklace is the way to go. Collar necklaces are also often called crew necklaces because they fit around your neck just like a crew neck t-shirt. They are distinct from the choker necklace in that they tend to be a little shorter in length. Collar necklaces are short, usually around 12 to 13 inches in length. Collar necklaces sit flush against the skin and rest right above the collarbone. They are usually made of multiple layers of strands, pearls, and other materials. Collar necklaces look dazzling when made of pearls, beads, or gems, but you can go for a more casual look with multiple strands of gold or silver. Originating in Greece, the festoon necklace design means a wreath or garland of woven flowers, leaves, and branches. The festoon necklace is defined by its draping elements. Delicate chains are often paired with gemstones, pearls, and precious metals. For the festoon necklace to sit properly, the main chain should be choker length and should rest on the collarbone. The festoon necklace looks best with off-the-shoulder formal wear. Clothes with high necklines could twist and distort the drops of the festoon necklace. The graduated necklace is a single-strand necklace usually made of materials, such as beads, that have a variation in bead size. The beads gradually get smaller as they go back, and the larger beads are placed in the center. The beads are small starting at the clasp, but usually get larger as they hang around your neck. Pearl necklaces are often graduated. The lariat necklace is often longer in length than the opera necklace. The lariat is a variation on the rope necklace, but are often referred to as rope, or Y-necklaces. The lariat is a unique necklace design in that it does not have a clasp. The beads or chains form a very long rope that you can pull through a rounded filter and tie at the front. This piece is a scarf-like neck piece that wraps around the neck and has just one strand hanging down. The lariat is very long: it will sit just below the belly button. If this is too long, you can wrap it around your neck a few times to make a choker. 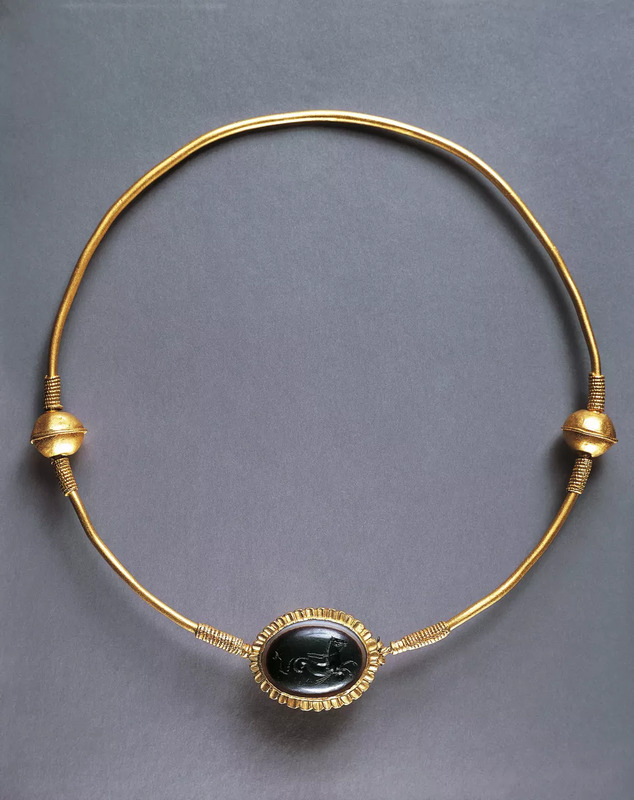 The lavalier necklace came about in the beginning of the 20th century and consist of a slender chain with a small pendant that has decorative stones or elements hanging from it. The design of this necklace often looks best with a feminine, bohemian fashion. The typical length for the lavalier necklace is princess length (16 inch necklace), right below the collarbone. The locket necklace is a traditional type of pendant necklace that is often passed down from generation to generation. The locket necklace has a small compartment that can hold a small picture or memento. Locket necklaces are very sentimental and personal necklaces. They were very popular during the Victorian Era, when you would find a lot of individuals with lockets that had engravings or a loved one’s lock of hair inside. Today, locket necklaces can have a variety of different kinds of chains, but are often paired with an opera length chain (30 to 36 inches). You can pair a locket necklace with a choker necklace, for instance, to get a multi-layered necklace design. The matinee necklace is often paired with a dress or blouse that has a plunging neckline. Sitting right above the bust, the matinee necklace is usually between 20 and 22 inches long. This necklace is embellished with beads and stones. Most women love this style of necklace because of its length. Matinee necklaces are great for layering because they are longer than princess length and shorter than opera length. When layering with other jewelry, use the matinee necklace as the focal point. These necklaces also look great with high necklines or turtlenecks, since they draw the attention to the bust area. The multi-colored string necklace is a variation on the string necklace. This necklace is often made of multi-colored beads of all different sizes and shapes. When it comes to the multi-colored string necklace, the focus tends to be on the colorful beads, rather than on the chain, or string. A necklace such as this can be paired with any event -- going out to the movies, going dancing, a casual dinner at the beach, shopping, you name it! If it’s the Fourth of July, choose a red, white, and blue one! If it’s Christmas, pick out a green and red one! With these types of necklaces, you can accessorize for the event! Opera necklaces are usually between 26 and 36 inches in length, and are perfect for dresses or blouses with deep necks. The opera necklace is a versatile piece of jewelry that is usually worn to formal events. However, this style of necklace is so popular that they can be worn almost anywhere and for any occasion. One of the great things about opera necklaces is that they can either be worn as a single strand, or paired with lots of other opera necklaces of varying lengths to create a multi-layered design. These necklaces can be made with anything from pearls to beads! Whether you’re going to a cocktail party or the movies, the opera necklace is the necklace to wear. A single strand pendant necklace usually features either a silver or a gold chain and has a single focal piece in the front. The pendant necklace is one of the most popular necklaces because they are often also sentimental. The pendent can feature a single charm or a precious gem. The beauty of the pendant necklace is that it is easily customizable. You could give them as a gift with someone’s initials engraved on them! Plastron necklaces are heavy and tend to cover the entire area right about the bust. Plastron necklaces add intrigue and extravagance to any outfit you wear. Almost always, they are a solid necklace, but can be made of wood, silver, beads, or glass! Wearing a plastron necklace makes you feel like a million bucks, which is probably why they are so popular today. Whether you are going for fancy or casual, this type of necklace will be sure to liven up any outfit you put on. Princess necklaces tend to stand out based on their length and style. Usually, the princess necklaces is an 18 inch necklace, and is often decorated the pendants or focal pieces. Available in both heavy and light designs, the princess necklace will often hang just below the collarbone. This type of necklace is usually reserved for formal events, but it could also be paired with a blazer and v-neck for work! Religious necklaces usually feature a pendant or a charm with a religious symbol on it, like this one. 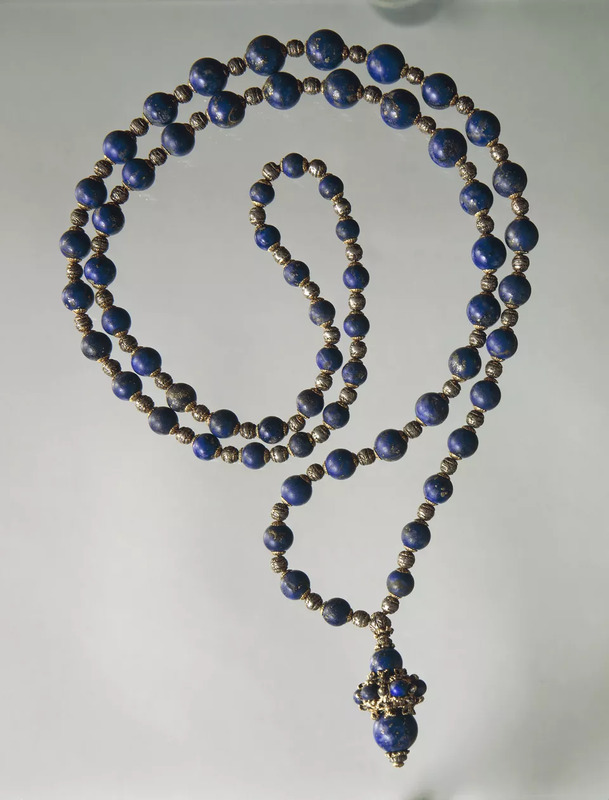 Religious necklaces can vary greatly in length, clasp style, and materials. They can be worn everyday as a sign of your faith, or can be paired with formal dress clothes for special family gatherings. The Riviere necklace has one or two rows of precious gemstones. As the necklace flows to the back, it is common for the gemstones to get smaller in size. 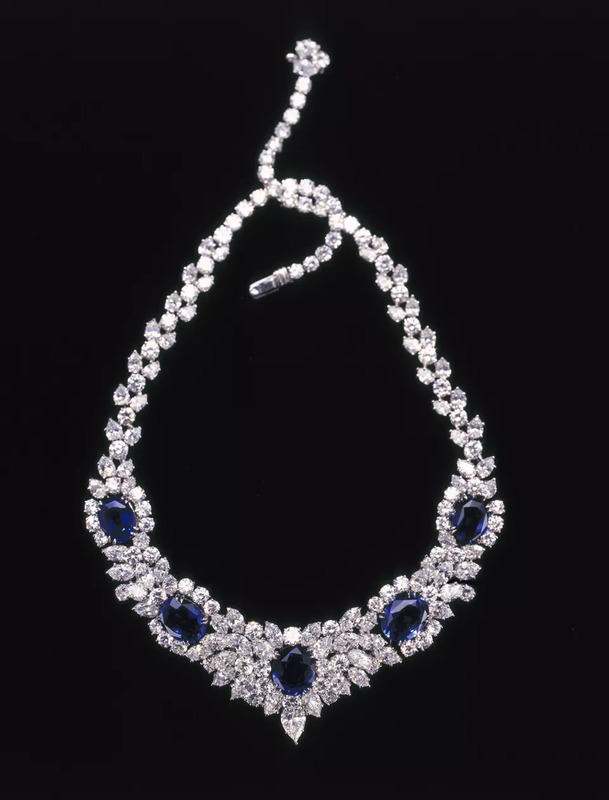 Often, the length of the Riviere necklace is either a princess size (16 inch necklace) or a collar size (12 inch necklace). Traditionally, the links of the necklace are close together so that you cannot see them. The design of this type of necklace is intended to emphasize the stones, and is often considered a classic choice for a formal event. A rope necklace is any necklace longer than opera length (30 to 36 inches). A Sautoir necklace is a French term used to describe a long necklace with an ornamental pendant at the bottom. These ornaments are often a fringe or a tassel and are either opera length or longer. These necklaces became popular during the Art Deco movement in the beginning of the 20th century. These necklaces are so long that they are often worn wrapped around the wrist, as bracelets! Statement necklaces are bold, large pieces with pendants and ornate details. Just because they aren’t designed to be subtle doesn’t mean they can’t be tasteful. Whether you’re looking for sterling silver, pearls, diamonds, rubies, metal, stone, pendants, beads, or coral branches, statement necklaces pop! Often also called a string necklace, thread necklaces are very casual necklaces that can be paired with a casual dress or a blouse. Thread necklaces are very popular because there are a lot of different items you can place on the thread, depending on what style you are going for. For instance, you could add silver pendants, large beads, or items of wood or metal. Thread necklaces vary greatly in length and can be as small as 14 inches or as long as a 20 inch necklace. Since a knot at the neckline is usually how the necklace ends are fastened, you don’t have to worry about any of the different types of clasps mentioned above. Thread necklaces are great, multi-purpose necklaces that can go with just about any outfit. A torque necklace is a super unique kind of necklace. It is open in the back and comes to a point at the front. It is a solid necklace, usually made of metal, that is worn close to the skin. Regardless of the outfit you are wearing, the torque necklace is super contemporary and chic and will make any outfit stand out. Featuring an open-back design, the torque necklace is a form of the choker necklace. The twisted necklace is commonly made of beads as the necklace material. Unlike other bead necklaces, a twisted necklace is made with multiple strands that are often twisted around to give it a unique look. Other materials can be used, such as wire-like strands. Twisted necklaces can come in a variety of lengths and might even have a charm dangling in the front. In the back, twisted necklaces tend to have super fancy and decorative clasps. The complete guide to different types of necklaces! We hope you got some great ideas for you next necklace! Whichever necklace design speaks to you most, there are a lot of different necklaces with meaning you can choose from. Different types of chains and necklace materials determine a unique style. We hope you have a better idea of which types of necklaces are the ones for you and you’ve found your next style!